Narrow, conical tree up to height of 46 m, bole up to 2 m diameter. Evergreen, coniferous. Crown is cone-shaped with regular whorls of horizontal branches, upturned near their ends. Bark is dark grey. 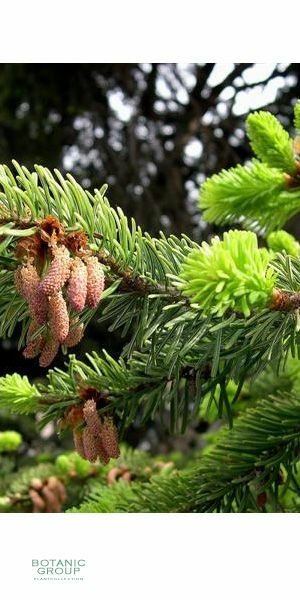 Needles are shiney green on top and silvery beneath - up to 3.5 cm long. Native of central European highlands. Prefers a cool, moist climate and acidic soil. Yellow male flowers are grouped on undersides of twigs. Green female flowers on upper sides near top of tree. Cones 10-15 cm long. 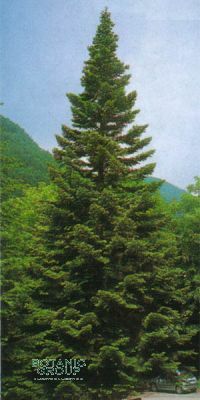 The Abies alba is one of the most well-known garden conifers. When this plants receives sufficient space, it will develop a magnificent shape. The soil should be deep and well-draining. Most Abies-species do not tolerate alkaline soil. If possible, place it in an open space in full sun or part shade.